Everywhere in the house, there were pig figurines, pig pictures, pig cups and plates, pig blankets and maybe even pigs in a blanket in the oven. I have never seen so many pig-related items in one place before or since. I half expected a pot bellied pig to come wandering through at any moment. In a word, it was porcine decor at its finest, if porcine decor can be considered fine. 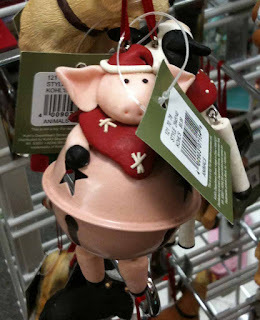 And I suspect that if I had walked through that home at Christmas time, I would have seen pig ornaments on their Christmas tree, like this one that I saw in a store earlier today. At least one person who lived in that house was a pig lover of the highest order. Oink! Contrast that with my house, where there is nary a pig ornament on my tree, and no pig decor to be found anywhere else, unless you count the little flying pig outside my front door. But I do have some tell-tale signs throughout the house that might suggest to guests that I enjoy gardening. Year round, there are hoes and watering cans everywhere, plus a sunroom full of plants. 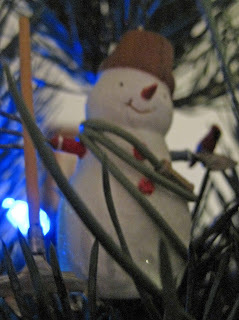 Then at Christmas time, I decorate my Christmas tree with ornaments that relate to gardening in some way, like this snowman tangled up in a garden hose. But to put it all in perspective, I don't think it is nearly as odd as those people with the pigs. Your snowman on the other hand is very stylish, I like him a lot. My sister used to have a thing for penguins, so each to his own! I'm afraid my xmas tree decorations are nearly so interesting. No pigs here either. Would love to see your Christmas tree and some of your favorite ornaments on it!! Is the topper a hoe? I have quite a few birds in the house so I guess I can't say much about the pig people. You can certainly see the love of nature in our house. I don't think having gardening items on your tree is odd at all. This coming from a person that has a garland dedicated to birds AND a gardland dedicated to gardening not to mention the overflow on the tree. I always thought pig figurines were cute, some of them make me laugh, but yet..I have not one in my house. I do have a few bird figurines and would like to collect much more I love birds. The holes wrapped around the snowman is cute, he looks a little like the actor and comedian W.C. Fields. I love the idea of garden related ornaments. I'm disappointed that I didn't think of it! Each to their own right? As long as they do not force it on the rest of us. These plastic blow up giant things that sit in front yards on different holidays are a bit over the top. Thank goodness I only see a few when driving into a nearby town. I think your snowman with the hose is great... I almost did not see the hose until you pointed it out. Your post reminds me of a movie "Leon the Pig Farmer" pigs were everywhere in that house! LOL. So I can easily imagine your tour of the house where the pig lover lived. Tiny watering cans, birds and nests find their way onto my trees. It will be fun to see what you have to offer. my welcome pig has a few oinks to settle with you! I am glad to report that no one has seen fit to create a collection of them for me. He fits nicely in our Outsider Art collection and dresses up for the holiday nicely. I had a thing for pigs, too. But in my defence, I was working in the hog industry at the time, managing a large farrow-to-finish farm...and I was quite delighted by piglets. Still am, although I don't put the little wooden pig ornaments on the tree anymore. They're in a trunk along with an assortment of brass, china, pottery, iron and other pigs. Now I just have penguins on the tree. ;-) And a few rocking horses. I don't have any pig ornaments. Or garden ornaments. In thinking over my collection, I'm trying to think if there is a theme. I have lots of glass icicles because we get so few ice storms here that I needed some to help remind me it's winter. I have many little bird ornaments. Mostly, I have old-fashioned, handmade toys ornaments--things that evoke childhood of an earlier time. I've considering updating that--I've seen iPod and game controller ornaments. I like that snowman with the garden hose and I want one! I do have garden themed Christmas ornaments, There are even some that I like to put on a tree in the courtyard, when a suitable tree is residing there. This year the Japanese Maple I scored at 70% off may get all dolled up for Christmas. What a very cute idea, a snowman tangled in a hose--love it--and don't think it odd at all for your house to have gardening stuff all over. Mine too ;). My whole nativity is gardening themed.